I really enjoy getting up close to objects when I’m using my cameras. Sometimes there are details that might otherwise be missed, if the entire object was the subject. 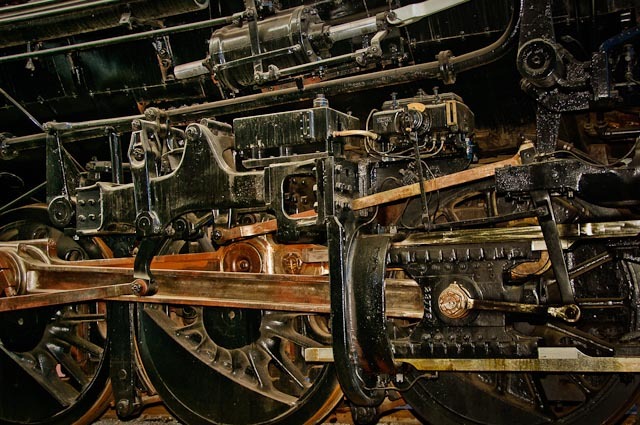 In this case, I focused in on the mechanical parts of an old steam locomotive, and what I got tells a story of its own. When I look at this image, I can almost smell the oil and grease covering the moving parts. I used an external flash unit on my D300 to take this photo (f4, 1/60) but dialed down the flash output to eliminate harshness. How to do that depends on your camera and flash, so read your instruction manual. It’s all about what you want to convey to others who will see the final result, so you have lots of latitude in being as creative as you want. Nice thing about digital cameras, is that you can shoot and delete at will, on the spot until you get the effect you’re looking for. Processed in Adobe Lightroom 2.6.